Leigh Anne Duck edits the journal The Global South. 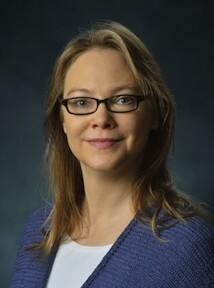 Her published work concentrates on literary and visual representations of the U.S. South, often using transnational methodologies. Her current book project is tentatively titled On Location in Hollywood South: An Aspirational State in Uncertain Times. On Location in Hollywood South: An Aspirational State in Uncertain Times, in progress. 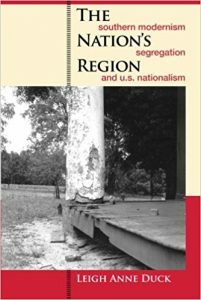 The Nation’s Region: Southern Modernism, Segregation, and U.S. Nationalism (Athens: U of Georgia Press, 2006). “Commercial Counter-History: Remapping the Movement in Lee Daniels’ The Butler,” forthcoming in The Jim Crow South in the Black Atlantic, 1860s-1960s, eds. Nicholas Grant and Elisabeth Engel, spec. issue of Journal of American Studies. Co-authored with Anne Lewis, “Southern Transformations: Three Documentary Films by Anne Lewis,” Navigating Souths: Transdisciplinary Explorations of a U.S. Region, eds. Michele Grigsby Coffey and Jodi Skipper, (Athens: U of Georgia P, 2017), 182-200. Co-authored with Sabine Haenni, “Introduction: New Images of the City,” Global South 9.2 (2015 ): 1-17. “Racial Segregation,” Keywords for Southern Studies, eds. Scott Romine and Jennifer Greeson (Athens: U of Georgia P, 2016), 60-70. “Arts of Abjection in James Agee, Walker Evans, and Luis Buñuel,” Oxford Handbook of the Literature of the U.S. South, eds. Fred Hobson and Barbara Ladd (New York: Oxford UP, 2016), 290-309. “Undead Genres/Living Locales: Gothic Legacies in The True Meaning of Pictures and Winter’s Bone,” Undead Souths: The Gothic and Beyond in Southern Literature and Culture, eds. Eric Gary Anderson, Taylor Hagood, and Daniel Cross Turner (Baton Rouge: Louisiana State UP, 2015), 173-86. “The World of Jim Crow,” William Faulkner in Context, ed. John T. Matthews (Cambridge: Cambridge UP, 2015), 135-43.